Despite the many challenges Angelenos face when it comes to alternative methods of transportation (read: not a car), 2010 turned out to be a surprisingly hopeful year in advances for livable streets and the results of the Streetsies Awards at L.A. Streetsblog prove it. L.A. Streetsblog asked readers to vote on many bike-friendly issues facing residents from Best Decision by Metro (winner: Board Saves 30/10) to Best Traffic Calming Project (Judge Ruling that Westwood Calming Measures Need to Go Back) and Best Legal News (Angelina Everett Gets Jail Time for Hit and Run Crash of Ed Magos) and the blog also weighed in. The sheer number of options in each category demonstrates progress, though there&apos;s much work to be done in the years ahead. 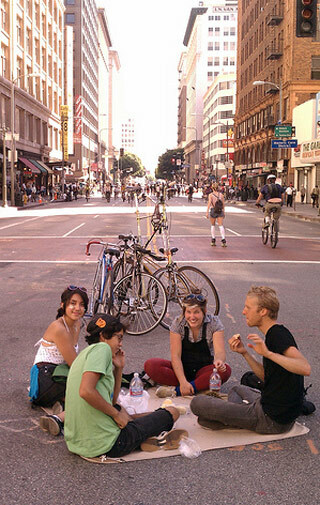 Our favorite Streetsie Award: CicLAvia was named the Liveable Streets Turning Point of 2010. Though there was some stiff competition in the category (Mayor rides a bike and crashes, LAPD joins Critical Mass post-crackdown), L.A. Streetsblog notes that CicLAvia towers above the other events because it "began to re-shape Los Angeles." The money quote: "Three and a half months later CicLAvia seems like a great memory. 12 months ago, it seemed unthinkable." Here&apos;s to more landmark progress in 2011.